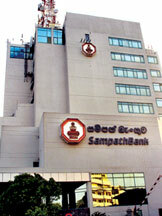 Sampath Bank PLC has introduced several technological features to enhance customer experience. Adding convenience and accessibility to banking, Sampath Bank has extended the cheque clearing deadlines, giving its customers the advantage of depositing cheques at any of the Bank's 196 branches islandwide and introduced 'Sampath Easy Cheque Deposit' (ECD) system. "These features are some of the many new enhancements we offer our customers to make their banking experience one of convenience. We understand that in this day and age, time is of consequence for customers and we have made banking an effortless exercise," said Rohana Dissanayake, Chief Manager - Deposits and Remittances, Sampath Bank PLC.